Representative Susan Molinari crafted a meteoric political career as a moderate Republican who could reach out to an increasingly important voter demographic: young, suburban, middle–class mothers. Hailing from a Republican political dynasty that had played a role in Staten Island politics for nearly 50 years, she succeeded her father—Guy Molinari—in the U.S. House of Representatives. When the Republicans took control of the House in 1994, they quickly elevated the charismatic Molinari to prominent positions, giving her a place in GOP policy deliberations. 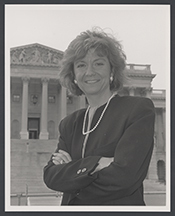 When Susan Molinari was sworn into Congress on March 27, 1990, she received assignments on the Small Business and Public Works and Transportation (later, Transportation and Infrastructure) committees. In the 102nd Congress (1991–1993), she took a seat on the Education and Labor Committee and left Small Business. When the Republicans took control of the House in the 104th Congress (1995–1997), Molinari traded in her Education and Labor seat for a place on the Budget Committee. From her post on Education and Labor, Molinari sought to strengthen laws to prevent sexual abuse and domestic violence. She also introduced several initiatives to encourage businesses to diversify their work forces and bring more women into the management ranks. In 1993, she voted for the Family Leave Act, which required companies to grant employees a minimum of six weeks of unpaid leave for care of a newborn or a sick family member. She also used her committee assignments to tend to district business. Molinari used her Public Works and Transportation seat to impose stricter regulations on Staten Island's Fresh Kills landfill, which had a bad environmental track record. In 1990, Molinari also managed to keep federal funds flowing for the construction of the Stapleton Homeport, a U.S. Navy facility located on Staten Island. Aside from her committee work, in 1992 and 1993, Molinari traveled to Croatia, one of several states which emerged after the disintegration of Yugoslavia. Many Staten Island constituents had family ties to the Balkans, and Representative Molinari took a keen interest in urging the U.S. government to recognize the republic—a move that would facilitate expansion of aid efforts. In August 1993, Molinari became engaged to Congressman Bill Paxon, a rising star in the GOP who represented a suburban Buffalo, New York, district. Paxon dropped to his knees on the House Floor and proposed. "I said, ‘Yes—but get up,'" Molinari recalled.8 Molinari and Paxon married July 3, 1994.9 The next few years were heady ones for the young Washington power couple. By 1993, Molinari was the darling of the Republican Party—a smart, articulate, spokeswoman in a party with a dearth of female faces. She considered a run for New York governor in 1994, but passed on it, citing her desire to cultivate an as–normal–as–possible married life.10 In 1996, Paxon and Molinari had a daughter, Susan, born on May 10. Representative Molinari became one of just four women to give birth while serving in Congress. Another daughter, Katherine Mary, was born several years later. In the late fall of 1994, Molinari won the vice chairmanship of the Republican Conference, making her the fifth–ranking Republican in the House and one of the highest–ranking women ever in the GOP leadership. In the summer of 1996, party leaders chose Molinari to deliver the keynote address at the Republican National Convention in San Diego, which nominated Senator Robert Dole of Kansas as its presidential candidate. She fit the profile that GOP leaders were seeking to appeal to: the young, middle–class, suburban mothers whom incumbent President William J. Clinton had lured away in droves in the 1992 campaign. Observers believed that by choosing Molinari, Dole was extending an olive branch to party moderates and pro–choice advocates alienated by House conservatives. Molinari took center stage at the GOP convention, while controversial congressional Republican leaders were given less prominent roles. In late May 1997, Molinari announced her retirement, effective that August, to pursue her lifelong passion as a television personality and focus on raising her family. House Republicans and other colleagues were stunned by that decision, one which Molinari insisted she had been considering for more than a year.16 Less than two months later, Bill Paxon fell out of favor with Speaker Newt Gingrich. He resigned his post as one of Gingrich's top lieutenants in July 1997 and did not seek re–election a year later.17 Susan Molinari's career in television as cohost of the "CBS News Saturday Morning" program was short–lived. After nine months, she left to teach as a visiting Fellow at Harvard's Kennedy School of Government in the fall of 1998. In 1998, she wrote Representative Mom: Balancing Budgets, Bill, and Baby in the U.S. Congress, a memoir of her career on Capitol Hill. She continued to do television political commentary and opened a Washington–based consulting firm. Molinari also chaired the Century Council, a nonprofit which aimed to curb underage drinking and drunk driving. Molinari and her family reside in Alexandria, Virginia. 1Mary Voboril, "Prime Time: Susan Molinari is 38, Urban, Italian, a Working Mother and an Abortion–Rights Advocate," 12 August 1996, Newsday: B04. 2"Susan Molinari," Associated Press Candidate Biographies, 1994. 3Catherine S. Manegold, "Her Father's Daughter and Her Party's Luminary: Molinari Finds Herself on National Stage in Republican Spotlight, on Her Own Terms," 18 May 1993, New York Times: B1. 4Donatella Lorch, "Molinari Sworn as New Leader on Staten Island," 15 January 1990, New York Times: B3. 5Politics In America, 1994 (Washington, D.C.: Congressional Quarterly Inc., 1993): 1057. 6Frank Lynn, "G.O.P. Tries for Dynasty in S.I. Race for Congress," 17 March 1990, New York Times: 31. 7"Serrano and Molinari for Congress," 15 March 1990, New York Times: A22. 8"Election Statistics, 1920 to Present," http://clerk.house.gov/member_info/electionInfo/index.aspx. 9"Rep. Bill Paxon Says, ‘Will You Marry Me?'" 6 August 1993, New York Times: A22. 10Lois Smith Brady, "Susan Molinari and Bill Paxon," 10 July 1994, New York Times: 36; "Chronicle: Two Members of New York's Congressional Delegation Marry," 4 July 1994, New York Times: 25. 11"Susan Molinari Will Not Run for Governor," 14 December 1994, New York Times: B3. 12Maureen Dowd, "Growing Sorority in Congress Edges Into the Ol' Boys' Club," 5 March 1993, New York Times: A1. 13"Susan Molinari," Associated Press Candidate Biographies, 1994. 14"Susan Molinari," 22 May 1994, New York Times: CY13. 15Ian Fisher, "Standing Out Among the Men in Suits: Molinari, an Urban Republican, Balances Power and Pragmatism," 2 May 1996, New York Times: B1. 16Lawrie Mifflin, "In a Surprise Move, Molinari Is Leaving Congress for TV Job," 28 May 1997, New York Times: A1. 17Jerry Gray, "Representative Paxon, in Power Struggle, Is First Casualty," 18 July 1997, New York Times: A1; Steven Erlanger, "Paxon Says He Doesn't Want Speaker's Post Despite Revolt," 21 July 1997, New York Times: A14; Lizette Alvarez, "Ex–G.O.P. Star Says He'll Quit Congress in '98," 26 February 1998, New York Times: A1. Videocassette: 1990, 3 commercials on 1 videocassette. The commercials were used during the campaign of Susan Molinari for the 1990 U.S. congressional special election in New York, Republican Party. Molinari, Susan and Elinor Burkett. Representative Mom: Balancing Budgets, Bills, and Baby in the U.S. Congress. New York: Doubleday, 1998. "Susan Molinari" in Women in Congress, 1917-2006. Prepared under the direction of the Committee on House Administration by the Office of History & Preservation, U.S. House of Representatives. Washington: Government Printing Office, 2006. The Honorable Susan Molinari remembers debating Representative John Boehner of Ohio during a committee hearing. The Honorable Susan Molinari recalls focusing on the Violence Against Women Act.